Then we expanded the collaboration to an app “EP” featuring two songs, including a new track: “Carried Away.” Each song can be experienced in two modes – one is an interactive music video, where the sequencing of graphics, animation, and photographs by Mark Borthwick are different every time. And if you touch the screen you make your own unique music video. 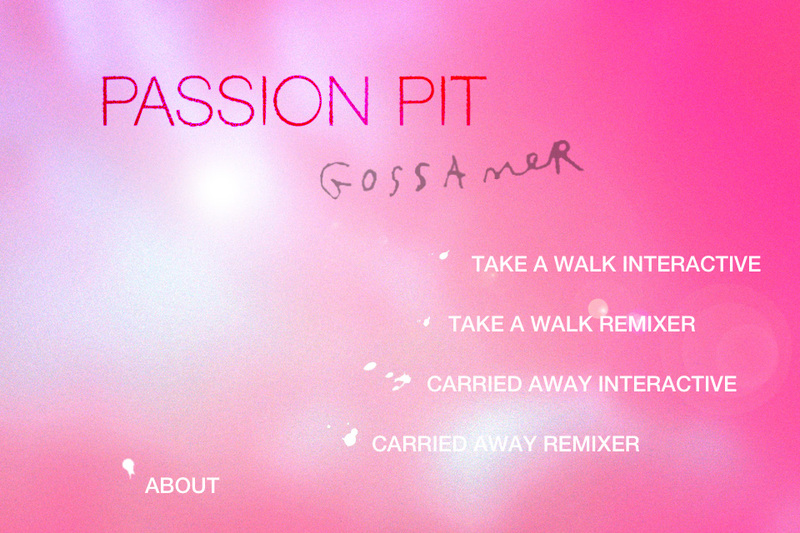 The second mode for each song is a “remixer” in which people can create their own music with Passion Pit’s raw material. For “Take a Walk” people can create new melodies on top of a backing track, by creating a kind of harp-string spider web. In the remixer for “Carried Away” all the parts of the song can be turned on and off via touch tiles. Some loop, while others are synth notes. If you’re skilled enough you can actually play the song through, and I’m looking forward to seeing if anyone pulls it off and posts to YouTube. The imagery for the app is all based on a bubble-like diagram that’s technically called a “Voronoi Diagram.” Snibbe learned about this pattern in college and it always fascinated him because it relates to everything from the structure of cells to the gravitational influence of stars. We chose it for this app because the first song, “Take a Walk” is about the financial bubble, and the hangover healing process coming out of it, so we thought this fragmented bubble imagery fit both metaphorically and psychologically. High-resolution images can be found below. For interviews and further information contact press@snibbestudio.com or +1 415 822 1442.